Easter Sunday is now past, but the season of Easter continues. The egg hunts and other phenomena connected with Easter are done, but at for some of us, Easter still speaks, for the resurrection stands at the center of our faith. Martin Marty's column, which came out on Monday, speaks to the way in which Easter is understood both in its "secular" form and its religious form. He makes mention of an article by conservative Catholic writer George Wiegel in the Wall Street Journal, which speaks to the rise of Christianity as being rooted in the inexplicable nature of the resurrection. I invite you to read Marty's article. Unfortunately, unless you are a Wall Street Journal subscriber you won't be able to read the articles referenced.In any case, I invite you to continue reflecting on the message of resurrection. 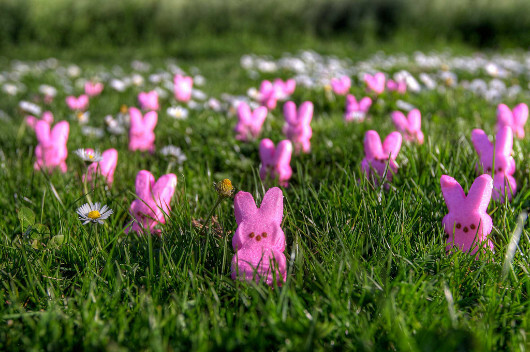 Easter parades survive in classic Hollywood films, on the avenues near cathedrals (which paraders pass but rarely frequent), in peeps, and in song. Seldom is there a trace of connection to the religious event which prompts Easter celebrations. Evidently there once was such a connection. But as Wikipedia remembers and comments: “By the mid-20th century, the parade’s religious aspects had faded, and it was mostly seen as a demonstration of American prosperity.” Peeps—those colorful marshmallow bunny- and bird-shaped seasonal candies—have now morphed into generic multi- or non-seasonal treats, the sweet religious particularity of Easter having thus “faded” at the candy counter. Christmas is easier for Americans in prosperity to address. The angels and infants of the Christmas story are now de-particularized, so they can belong to everyone in the worlds of commerce, publicity, and celebration. No offense. Easter, however, while the supreme holy day for most devout believing Christians, is harder to handle. The key event that inspires the observance is the resurrection, however witnessed and defined, of a dead person—or, in caps, the Resurrection of Jesus Christ. How to handle that in the media of a pluralist society, where believers in the event, while still in the majority, see their numbers declining annually? - Carmean, E.A., Jr. “Witnesses of the Risen Christ.” The Wall Street Journal. March 30, 2018. - “Easter parade.” Wikipedia. Accessed April 1, 2018. - Swaim, Barton. “In the Beginning Was the Word.” The Wall Street Journal. March 30, 2018. Author, Martin E. Marty (PhD’56), is the Fairfax M. Cone Distinguished Service Professor Emeritus of the History of Modern Christianity at the University of Chicago Divinity School. His biography, publications, and contact information can be found at www.memarty.com. Sightings is edited by Brett Colasacco (AB'07, MDiv'10), a doctoral candidate in Religion, Literature, and Visual Culture at the University of Chicago Divinity School. We are interested in 500-1000 word pieces relating to religion in the modern world. Most of our pieces respond to a news item, placing the event or trend in context of its history and other relevant background, and analyzing its media coverage. Send queries or completed essays to the editor at sightings@uchicago.edu. Copyright © 2018 The University of Chicago Divinity School. All rights reserved.